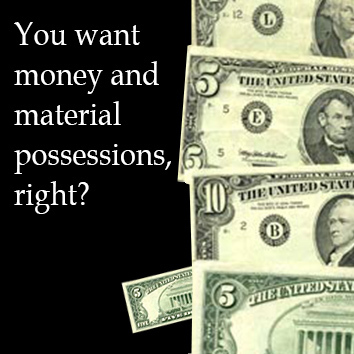 • You want money and material possessions, right? • Or do you want happiness? • Do you feel poor? Learn how to change that. • Trapped in the rat race? Find out what the rat race really is. • Find out what's keeping you in the rat race. • Get the two most important keys on how to escape the rat race. You want money, right? Lots of money! You also want things, material possessions. A nice big place to live, situated somewhere you like; and perhaps an extra place to live (like a cottage or summer house), somewhere else. You want nice means of transportation (cars, motorbikes, bikes, boats, etc.) and communication (telephones, computers, personal digital assistants (PDAs), etc.). Furthermore, you want nice clothes, nice food, nice entertainment and lots of other nice things that you would maybe call necessities. You want all that, right? Or, most of it at least. Well, there is no surprise there. Most people do. Your demands may vary according to your culture and where you live (and thus according to what other people around you have and you expect), but generally speaking YOU WANT IT ALL. Have you ever stopped to ask yourself why? WHY do you need all that money and all those material possessions? The previous sentence actually contains the key. The key is the word 'need'. You experience some sort of need inside yourself. You think and believe something about this need and the fulfilment of it and you let that control you. It's all happening inside you. Now, you don't NEED to know what is going on inside you, of course. 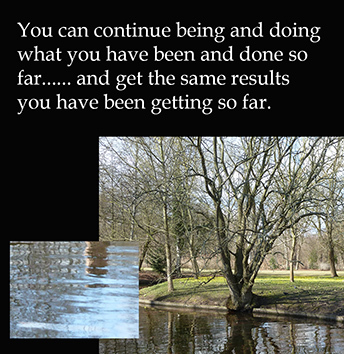 You can just continue being and doing what you have been and done so far ... and get the same results you have been getting so far. But is that what you want? If you are one of the countless people who have been participating in what has interestingly been called the rat race, and you are reading this, chances are that you are getting tired of being in the rat race. Tired of getting the results that you have been getting so far. You may be ready for a change. Your results up until now may be great in terms of money and material possessions ... or they may be less than great; they may even be dismal. Either way you are probably looking into personal development, self help, self improvement and spirituality because you are not satisfied. You want your needs satisfied. It's as simple as that. This is the primary reason why you engage in the rat race. The primary reason why you want money and material possessions. It's so that you can get your needs satisfied. But you know what? It doesn't work. Or, it works, but only a tiny bit - up to a level which you will VERY quickly reach. After that it is a fact, an annoying fact, that the 'hole' you feel inside you CANNOT be filled up using money and material possessions. 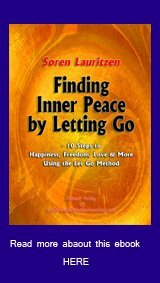 So, maybe you DO need to understand what is going on inside you - and how to deal with it. You need some knowledge and some keys to escaping the rat race. If you currently feel poor, getting money and material possessions is quite possible and attainable. Ultimately, though, more money and more material possessions are NOT going to satisfy you. How much is ENOUGH? Exactly how much? Exactly how much money (e.g. per month) is enough? Exactly how many houses, apartments, refrigerators, cars, boats, chairs, paintings, clothes, toothbrushes, etc. is enough? First of all, please realize that money and material possessions are relative, temporary things. Sometimes you have them, sometimes you don't. If you let that matter too much to you, then you are making your life an unnecessarily bumpy and unhappy ride. This has been termed 'getting caught up in the money game' and 'unhealthy attachment to possessions', respectively. Accepting the fact that money and material possessions come and go, and that this is all right is an excellent, empowering thing to do. And why wouldn't you? The fact that they come and go means that even though they go away, they do in fact come back again. There is another, very important factor that we must take into account, though: Fear. 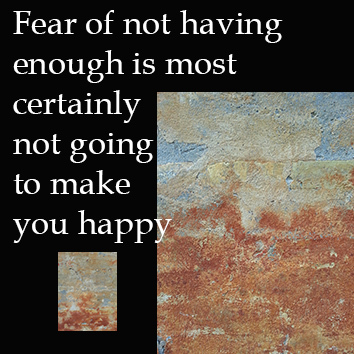 Most people fear not having enough, and if they fear it enough and start acting as though their fear were real, they may actually make it real in their experience. Interestingly enough, once you let go of your fear with regards to having enough money and material possessions, then money and material abundance start flowing to you all by themselves. Why? 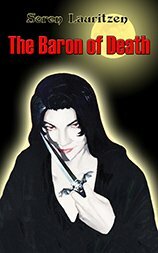 Perhaps because without the fear you are more open, receptive and in line with life itself? Let's look briefly at each of them so that you can distinguish them from each other. There are seven basic needs which come in an infinite number of variations. For example your basic human need for control comes in variations like: your specific needs to control your home (e.g. how it looks, what it contains and that you can pay the rent); or your job (e.g. that you are doing something worthwhile, getting adequately paid and get along with your colleagues and your boss); or your sport, or your partner, or your children, or your dog, or yourself, or simply an everyday shopping situation in your local store. Theoretically speaking all the seven basic human needs are relative and thus their fulfilment provides only temporary satisfaction. This is important! It means that even if you fulfil a need right now, the need will be back a moment later. If not today, then tomorrow, or the day after. Why? The answer is: Because the need is something like 90 percent THOUGHT and BELIEFS and only about 10 percent real. In other words, you do need some things (like water, food, shelter, love, meaning in your life, etc. ), but you only need about 10 percent of what you think you need. The rest is just make believe. Haven't you noticed how thoughts keep repeating themselves over and over and over? Well, since your needs are mostly thought, they do the same thing. In other words, your needs will keep coming back to haunt you. Do you really need that amount of money each month? No, you don't. Not REALLY. Do you really need that house, apartment, car, piece of designer clothing, you-name-it? Nope. Do you really need that EXTRA money and that EXTRA you-name-it? Of course you don't. Yes, you probably think you do ... in order to feel safe, maybe ... but really, you don't. Most likely it clutters up your life and you would probably be much better off with less. But you really think you need all that money, all those things. You really do. Because your needs keep coming back again and again. However, if you believe more that 10 percent of what your needs say, well, then you are setting yourself up as a rat in the rat race! Most people are like that ... you, too, if you are like most people. At some point you have started to believe the make believe of your needs, and at some point after that you have developed habits that support the fulfilment of those make believe needs. Today, those are old habits, and you do not even question them anymore. They are on the verge of becoming beliefs [LINK] to you, or they have already become your beliefs. So: You are trapped. Your own thoughts, make believe needs, habits and beliefs have made you a rat trapped in the rat race. There IS an alternative, though. The condition of happiness equals permanent satisfaction. (Please notice that I am talking about being happy for no apparent reason here; being happy simply because you exist). Permanent satisfaction ... this is what you are REALLY looking for! Interestingly, happiness is basically absolute in nature, which means that it is always there. If you do not experience some kind of happiness all the time (and most people emphatically do not) then it is simply because something has come in the way of your experience - much like the sun is always shining, but sometimes clouds get in the way of your experience of that. The most common type of 'cloud' (when it comes to happiness) is fear. I know that saying 'happiness is always there, like the sun' probably sounds unbelievable to many people. Nevertheless there are people walking this earth who are genuinely happy most of the time. And (happily) their numbers are growing (according to research). I have known a few of these people in my lifetime, and I guess I myself am rapidly becoming one of them. Some people consider happy people naïve or even stupid. Because they are not happy themselves, they cannot take happy people seriously. Well, that's just the way relative reality works. If you choose to be unhappy much of the time, then that's what you will be. Your personal reality will reflect your choice and be an unhappy reality. Being unhappy is just as valid a choice as being happy, and an unhappy personal reality is just as (personally) real as a happy personal reality. It's all up to you. To test the hypothesis that happiness is always there, all you have to do is start letting go of your fears. Whenever you release one of your fears, you become much more happy in the moment, and a little bit more happy on a permanent basis. 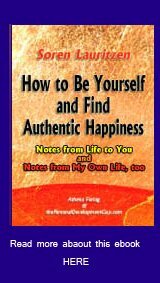 Please click on this link if you want to understand more about happiness. The secondary key to escaping the rat race and the mindless hunt for more money and more material possessions is ... your primary focus. Having your primary focus be acceptance based and on something positive is much more powerful than having your primary focus be fear based and on something negative. The positive, acceptance based focus is much more in tune with the way life is and works (unconditional love) than the negative, fear based focus. But isn't wanting more money and more material possessions a focus on GETTING? Yes, it is. But we are talking about your PRIMARY focus (in life) here, not just your focus on any given thing (like money or material possessions). Some people will answer 'both' to this question. Maybe you do, too. But that is because you are not being completely, unconditionally honest with yourself. You KNOW whether your primary focus is based in love (GETTING) or in fear (AVOIDING). And if you feel that you really, truly don't know, then you can probably assume that it is based in fear and a focus on AVOIDING, because that is how it is for most people, and if you have the love based focus, you will probably know it. Focusing on your need for money and material possessions will most likely lead you to fear and a condition of being unhappy most of the time - no matter how much money, etc. you get. Generally speaking you will probably want to focus beyond your needs, beyond money and material possessions. Happiness, inner peace and the meaning of life are good places to start. Also, money and material possessions come and go: sometimes you have them; sometimes you don't. Accepting this is a way to empower yourself. Furthermore switching your focus from fear and avoidance to getting that which you love and desire will empower you no end. The funny thing is that as you do these things, money and material abundance follow all by themselves!